1. Why should I choose Adoption Makes Family? Adoption Makes Family offers a personal touch that you won’t find at large adoption agencies. You will speak to the same person every time you call, not be transferred from department to department. Adoption Makes Family is a licensed, non-profit agency that works with both birth and adoptive parents, so we can carefully match your baby with the best family. 2. Is pre-placement counseling available? You may receive counseling from a professional adoption counselor who will help you explore options without pressuring you to make an adoption plan. 3. What type of information will I need to provide to create an adoption plan? We will ask you about your family and health background, the type of adoptive family you are seeking, information about your prenatal care and your relationship with the birth father. 4. What if I don’t have medical insurance? Most pregnant women without medical insurance are eligible for Medicaid benefits. 5. Can I be involved in selecting an adoptive family? You may choose the adoptive family who will raise your baby. We will ask you what you are looking for in an adoptive family and develop a specific profile to meet your wishes. 6. 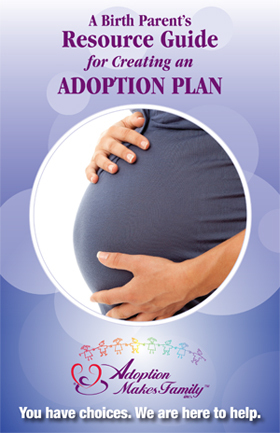 What type of information must the adoptive parents provide in order to be able to adopt? A social worker from Adoption Makes Family does a home study with possible adoptive parents to determine if they can provide a safe, loving and good family home for a child. The adoptive parents must provide numerous documents for this home study including their biographies, a health statement from their doctors, birth and marriage certificates, employment verification and financial information. Adoption Makes Family does background checks on all members of the household and collects references from friends, employers and relatives. In addition to providing this information, adoptive families must complete a special training program that shows them how to best meet children’s needs. This program includes information about child development, how to explain adoption to children and baby care. 7. What if one or both of the birth parents are under the age of 18? Birth parents who are under the age of 18 must have legal representation. The adoptive family pays for legal fees. 8. Can a birth parent under the age of 18 make a decision to create an adoption plan without the consent of a parent? While a birth parent who is under 18 is encouraged to talk about the adoption with a parent, you do not need a parent’s consent to create an adoption plan. 9. Must a birth father agree to placing the child with an adoptive family? Yes. Both birth parents must sign the consent for adoption. However, if a birth mother does not know the identity of the birth father, assistance is still available. 10. Are both OPEN and CLOSED adoptions available? Yes, open and closed adoptions are available. A closed adoption means we will protect your anonymity. An open adoption means that information may be shared between birth and adoptive parents. The degree of openness depends on the your wishes. 11. Can birth parents receive money or other forms of payment for an adoption? This varies from state to state. In the State of Maryland, birth parents may only receive financial assistance for medical and legal expenses. 12. I just learned my daughter is pregnant. What should I do? Learning about your daughter’s unplanned pregnancy can be very upsetting. Adoption Makes Family can help you and your daughter work through the many emotions you are experiencing. We will talk to you about options and help you and your daughter reach the decision that is best for everyone. Your daughter will need your love and support, no matter what decision she makes. We can counsel you to be the supportive parent she needs.